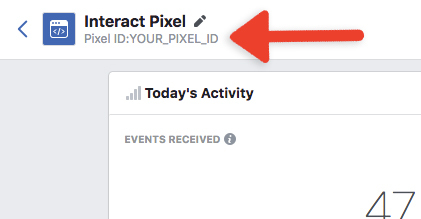 This article discusses how to connect your Facebook pixel to an Interact app and how to create custom conversions. Now paste your Facebook Pixel ID into the provided text box and click Save. 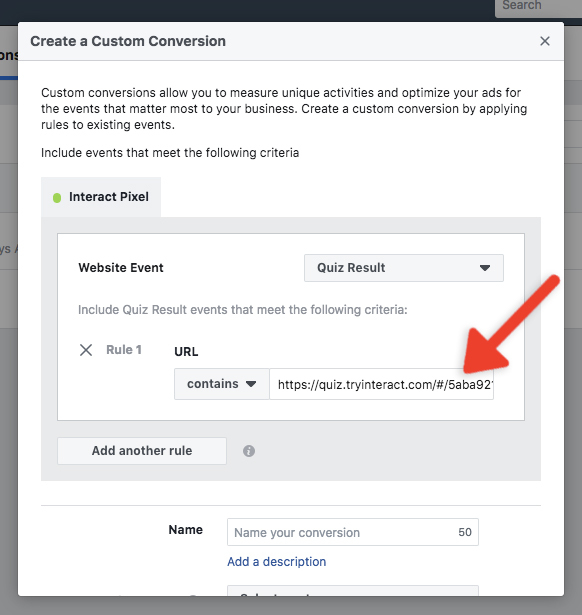 Now your quiz is connected to to Facebook Ads and there will be a Page View event created any time one of your users reaches the results of your quiz or poll. Now that you have the Facebook Pixel setup, you can customize the events that get sent based on the actions a user takes in your quiz. You can select the Facebook Pixel standard event from the dropdown for each of your quiz results or poll voting options that you would like to be triggered. For each of these options above you can begin tracking that event by checking the Active checkbox and editing the name of the event you want to trigger by typing in the textbox. 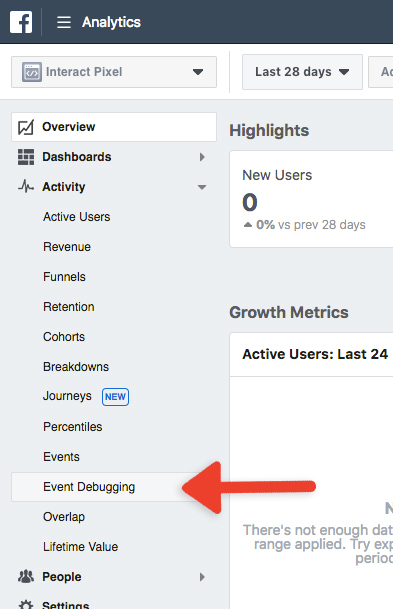 By default, Interact triggers a Page View event for two different triggers: (1) on quiz load and (2) on direct quiz URL visit (ex. https://www.tryinteract.com/share/quiz/ID). This helps carry successful conversions through from the time a quiz is visited to the time the quiz is finished. You have the option to turn off this default behavior by using the checkboxes under this section. 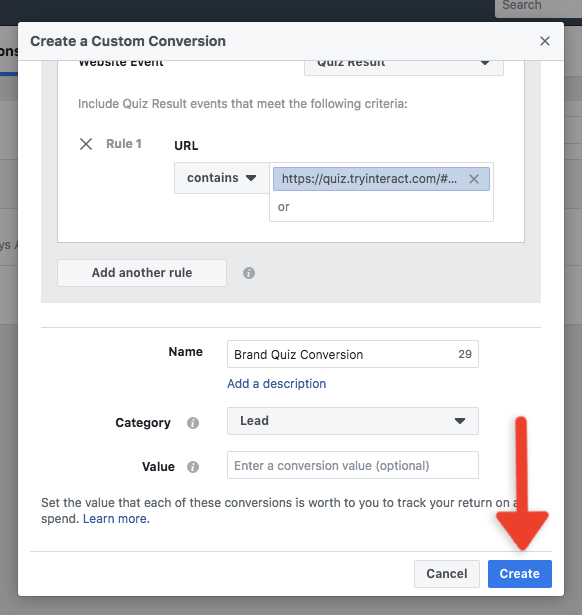 Now, move back to Facebook Ad Manager and set up conversions based on when people reach the results of your quiz. To do this, you'll navigate back to the Pixels section of your Facebook ads dashboard. Now click on the Custom Conversions tab. Then click Create Custom Conversion in the top right. Now, under Website Event choose the custom event from the dropdown that you would like to use to create a custom conversion. For this example, I will use the Quiz Result event, which will include everyone who completed my quiz. IMPORTANT: Custom events will only show up if the pixel has received events from your quiz. So at this point you should go back to the quiz builder and preview your quiz and take the quiz all the way through so that Quiz events are sent to Facebook. 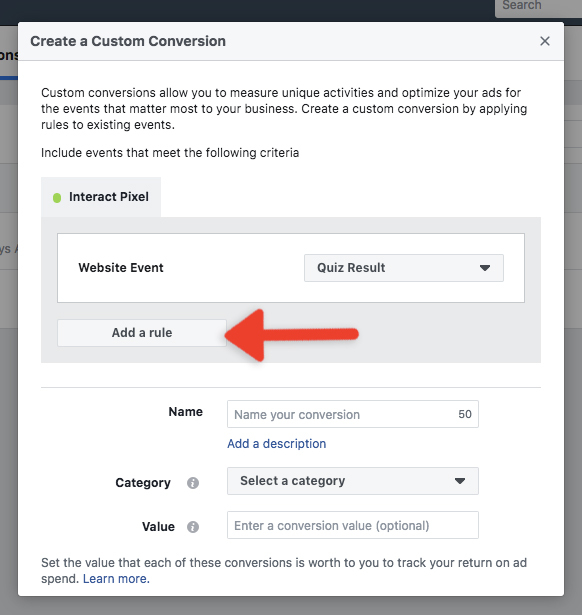 IMPORTANT: It can take up to 1 hour for Facebook to receive the events and prepare them to be used in setting up a Custom Conversion. Please allow this time to transpire before attempting to setup your Custom Conversion. 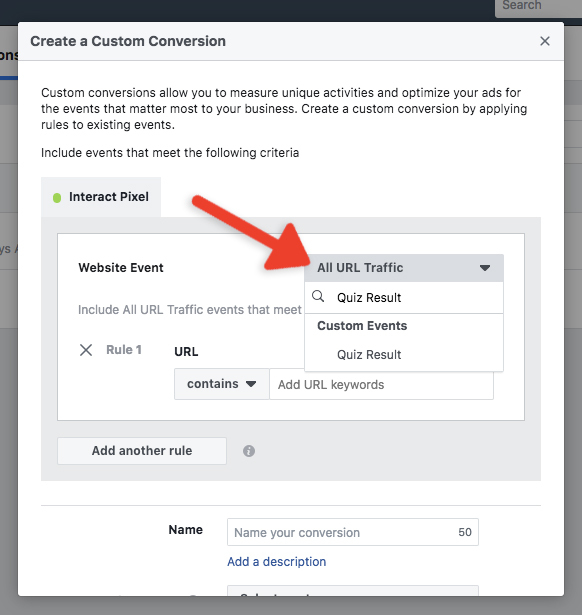 (Optional) If you want to distinguish certain traffic from the traffic coming from your specific quiz, you can add a rule to include only traffic from your specific quiz. To do this, click Add a rule. (Optional, cont.) For the URL, copy and paste the URL of your quiz which is in the form of https://quiz.tryinteract.com/#/APP_ID. Now, under Name create a name for this conversion. For this example, we are going to use Brand Quiz Conversion and then under Category select the appropriate category for what this conversion event is. For most cases this will be Lead because if someone reaches the results of a quiz that has lead capture turned on, they are a lead. 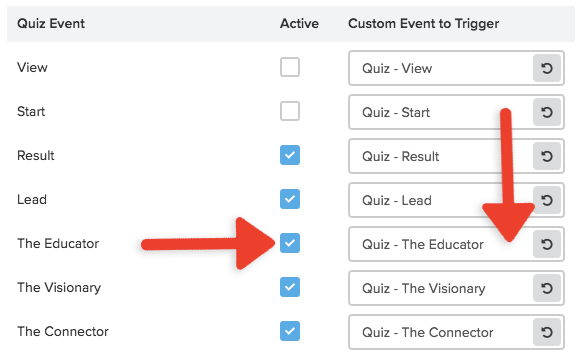 IMPORTANT: Now you will need to activate the conversion, which means you need the pixel to fire events from your quiz, which means you need to take your own quiz and reach the results. So at this point you should go back to the quiz builder and preview your quiz and take the quiz all the way through so that Quiz events are sent to Facebook. 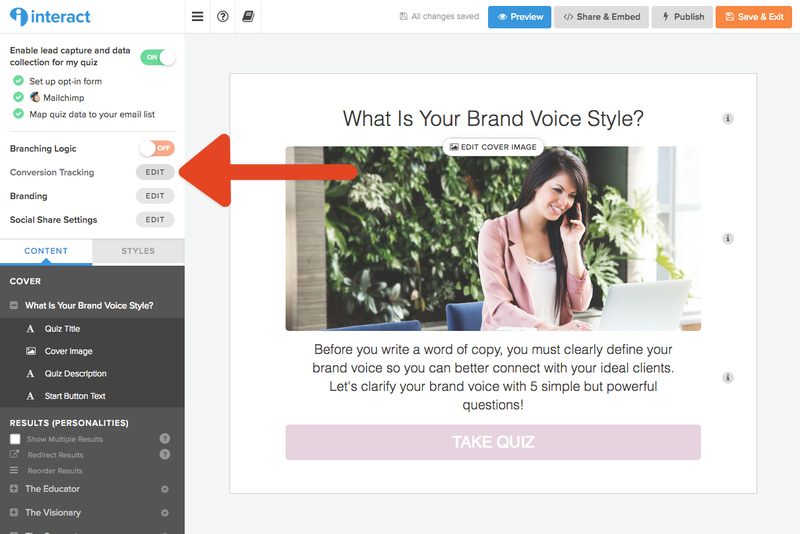 Make sure you take your quiz all the way through to your results so you trigger a conversion! Here you will find a list of all of the recent events captured by your Pixel with timestamps and all data that was passed with the event.